Two day National Workshop on “Network Simulator(NS-2)” which is being organized by Department of Computer Science SIRDA Institute of Engineering Technology on13.04.2017-14-04-17 Inaugural Session:The workshop was inaugurated at9:30 am on 13th April, 2017 in the conference hall of SIRDA Institute Of Engineering Technology. 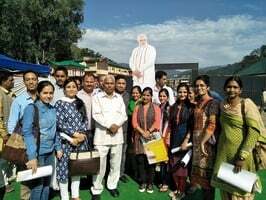 The one day workshop was organized jointly by the Himachal Pradesh Technical University (HPTU), Hamirpur and SIRDA Institute of Engineering Technology. Sh.R.S Chandel (HoD/Associate Professor) of Civil Engineering his inaugural speech welcomed the participants and appreciated organizing committees efforts for the workshop and spread objective of the workshop. The network simulator is discrete event packet level simulator. The network simulator covers a very large number of applications of different kind of protocols of different network types consisting of different network elements and traffic models.Network simulator is a package of tools that simulates behavior of networks such as creating network topologies, log events that happen under any load, analyze the events and understand the network. Well the main aim of our first experiment is to learn how to use network simulator and to get acquainted with the simulated objects and understand the operations of network simulation and we also need to analyze the behavior of the simulation object using network simulation. Sh. R.S Chandel, requested allthe participants to attend all the technical sessions which will provide therequisite insight on the subject and will help the practicing engineers to gaininformation and knowledge in respective application areas of Network Simulator. Sh. B.D.Thakur, Managing Directorof ToT run at SIRDA Group of Institution was guest of honor. He then addressedthe participants and informed. He explain little bit about NS-2(Network simulator)are used by people from different areas such as academic researchers,industrial developers, and Quality Assurance (QA) to design, simulate, verify,and analyze the performance of different networks protocols. They can also beused to evaluate the effect of the different parameters on the protocols beingstudied. Er.Sanjay Yadav (organizing secretary and HOD of Computer Science and Engineering) addressed the participantsand briefed them regarding Uses and research scope of NS2. 1. You can able to simulate wired aswell as wireless network. 2. You can compare different protocols and make conclusion on the basis of analyseddata. 3. You can study complex networks like Wireless Sensor Networks (WSN), 4G LTE,WMN, and MANET. 4. You will be able to add or modify the protocol. 5. Analyse network with wire shark, gnu plot, network animation tools and muchmore. We are conducting hands on workshop on network Simulator-2 [NS-2] ininstitutes. Workshop will cover all the necessary modules. Required software,information manual will be provided. Those who are passionate about learning new things. This workshop will helpful for bachelors’ students, researchers, educators. Who are looking for research in networking, network security, wireless networking. There were more than 65 participants from various organizations including teachers, M.Tech and B.Tech students who participated in the workshop. Sir,Mr Sandeep Kadam, Deputy Commissioner Mandi, the Chief Guest of thefacilitation ceremony in the honour of the Gold Medal winners, 2ndKabaddi Senior Fedration cup championship. I on behalf of the familyof SIRDA Group of Institutions heartly welcomes you on this occasionfor your visit to the Campus of our Institutions. SIRDA(Sunder Nagar Integrated Rural Development Association) is aregistered charitable society since the year 1985. The objective ofthe society is to facilitate and provide opportunities of employmentand earnings for the uplift of the economically weaker section of theSociety at moffussil level. Initially we were involved in trading andindustrial pursuits with a humble start. It was in the year 2009 thatthe Society decided to enter into the field of Technical educationwith a vision to participate in the socio economic development of thecountry and provide a fillip to the competitive technicalrequirements of manpower in the leading Technologies. SIRDA isapproved by the AICTE and is affiliated to the H.P.T.U. Hamirpur forDegree courses and H.P.T.S.B. Dharamshala for Diploma courses. M.Tech:-Civil Engg, Computer Science,Electronics and Communication,Mechanical Engg. B.Tech:-CivilEngg, Computer Science,Electronics and Communication, Mechanical Engg, Electrical and Electronics. Diploma:-Civil Engg, Computer Science, Electronics and Communication,Mechanical Engg Automobiles. Pharmacy:-Two Year Diploma in Pharmacy. ConstructionSector, Skill Development- TOT & TOA. SportsCoaching Accademy:- Kabaddi, Bolleyball, Basket Ball, Badminton. Healthybody has a strong mind. Extracurricular activities including sportsare important and integral part of the academic carrier of alearner. The SIRDA therefore, gives due and higher importance to suchactivities for the overall development of the students of thisCampus. We have a Sports Academy in our Campus and at present weprovide Coaching in Kabaddi, Volleyball, Basketball, Badminton,Through our Instructor and Couches . Hostel facilities for outsideacross the state Kabaddi girls players including free boardinglodging is provided by the Institution. At present 25 Sports girlsare residing in the hostel. Ourefforts in the field of Sports have also brought us allures andcolors in this small period of 5-6 years. 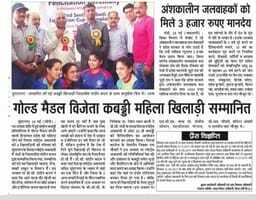 Inaddition we have been participating almost all the Kabaddi events inat Distt, State and National Level. Our one Star Player Miss BhavanaDevi has attended the National Selection Camp three times. She wasplaced at 13thrank, which is an achievement under such meager and inadequatefacilities. The1st H.P.T.U. Inter College tournament was organized in the SIRDA Groupof Institution during 2016. Five events were organized and the SIRDASports Academy won 3 Gold (Kabaddi, Volley Ball, Badminton double)and silver in single Badmition. TheIIT Mandi organized a North India tournament at Mandi during 2013 inwhich our team won silver medal in Volley Ball. 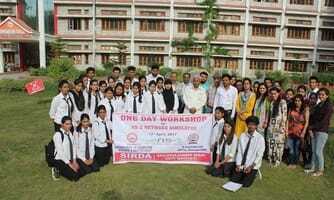 TheSIRDA find a large potential and immense interest in the youth ofour Institution as well as the State. Therefore, we are purposing toinclude other additional Sports like Judo, Boxing, wrestling andathletics events in this campus . A indoor hall of 6000 sqft hasalready been constructed, another 10000 sq ft is being purposed andsufficient land for 200 and 400 mtr track is available. TheSIRDA is doing its best to promote these activities at our own through our own resources. But we are also requesting the SAI to giveus a sports centre so that there participation is also ensured andour endeavor and burden is shared and the mission is carried in mosteffective way. 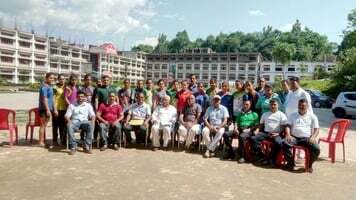 Lastbut not the least, I would evade my responsibility if I miss torecall the names of those star kabaddi players of SIRDA SportsAcademy, who have given this opportunity to assemble today on thisoccasion. Miss Bhawana Devi, Miss Reena Kumari, Miss Sakshi Thakur,Miss Simran Kumari, I congratulate and wish you all a bright andglories life ahead. Thank you. Brief Job Description: Assistant Electrician will be assisting level-4 electrician or superior in electrical work for the installation, repair, and maintenance of temporary LV electrical connections at the construction sites and permanent connections at residential and commercial buildings. The individual will be engaged in laying conduits for LV single phase wiring with appropriate selection and use of hand and power tools efficiently. 4 days domain (32 hrs min), 4 days Platform Skill Training (32 hrs min), 9th day Domain Assessment by CSDCI certified assessor & 10th day Platform Assessment by CSDCI certified assessor. (QP for Assistant Electrician, Trainer/Assessor is attached herewith) NSQF Level 3 & 5. Please nominate your participant(s) as per the attached nomination format at the earliest. · Laptop (to study and prepare for different exercises), geometry box, calculator. Print-out of attached QP- Assistant Electrician, Trainer/Assessor (as per their nomination choice), Sponsoring/ Parent organization’s issued identity card/ letter. · ID proof - Driving license/PAN CARD/Voter Id. · Mandatory: Aadhar Card (original & photocopy). · Two passport sized colored photographs. · Highest educational qualification certificate. c) All the documents/certificates handed over the candidate will be checked at the Training Centre on the 1st day of commencement of the training during registration process. Those candidates who are found lacking of qualification and experience criteria will not be allowed to attend the training of trainer program. Double Bed shared room with room heater, attached wc. Single Bed with room heater in (Campus) with attached wc. Kindly inform three days in advance about your choice to Mr Dharampal for smooth arrangement facilities. Please provide the transaction details for the confirmation of the amount transferred by an email to the respective organizations. a) It is a sincere request to conduct a round of in-house training by the organization on QP-NoS for their participants before sending them for this program. It will ensure better understanding and performance of the participants. b) There shall be a monetary penalization in case the participants are found absent, late or irregular during the conduct of the training program. Only after pre approvals from the council should such exceptional cases be allowed to attend the training. c) NO LATE ARRIVALS AND ABSENTEE PERMITTED WITHOUT PRIOR PERMISSION IN WRITING HAS BEEN OBTAINED. d) Candidates having Domain Qualification of the Job role of same level or above may join directly for Platform Skill. All the organizations willing to participate in this special project may avail this opportunity and nominate their eligible candidates to be certified through this program and become Trainer/Assessor accordingly. It is a kind request that the participant(s) must reach the venue by 8:00 amon 07th Jun 2017 morning to avoid last minute issues. Below mentioned is the Trainer/Assessor selection criteria. It is requested to screen and orient the candidates prior to sending them for the training event. c) BE/BTECH/ME/MTECH in Electrical engg. with minimum 1 Years of relevant Industry/Site experience. d) Training experience: less than 500 hours of training experience in skill ecosystem. c) BE/BTECH/ME/MTECH in Electrical engg. with minimum 2 Years of relevant Industry/Site experience. State Skill Development Mission skill training). This residential program will have a 4 days domain (32 hrs min), 4 days Platform Skill Training (32 hrs min), 9th day Domain Assessment by CSDCI certified assessor & 10th day Platform Assessment by CSDCI certified assessor. Domain Skill - To pass the Qualification Pack, every trainee should score a minimum of 50% individually in each NOS and aggregate is 80% which will be conducted by Industry/SSC Experts. Platform Skill - To pass the Qualification Pack, a trainee should score a minimum of 80% in each NOS. Please acknowledge the receipt of this email. Please call me for any clarifications. 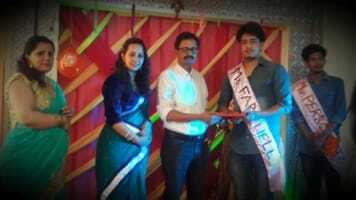 The Farewell Party to special outgoing students of final year students of Sirda Polytechnic .Everyone enjoyed the cultural programming given by freshers. Vicky and Rashmi were crowned as Mr. Personality and Miss. Personality where Ishan was winner for Mr. Farewall and Ridhi for Miss Farewall. Mr.Rakesh Kapoor principal Sirda Polytechnic wishes that God give them all the strength to groom into better human. B. Tech./ M. Tech. in Mechanical /Production Engg.